During this stage of life toddlers are observing everything around them, and everything parents are doing at home. The children are eager to try to do the same daily tasks that mom and dad do throughout the day. Maria Montessori quickly observed this as well and began to teach children daily tasks that we call ‘practical life activities’. These activities in the class are some of the most essential pieces of Montessori education. This area helps with independence, order, coordination and concentration. Food prep is a wonderful practical life activity that teaches children many different aspects. In the toddler class, there are a few food preparation activities out on the shelf each day. Food prep helps with self-care, as the child must wash their hands before beginning the activity. 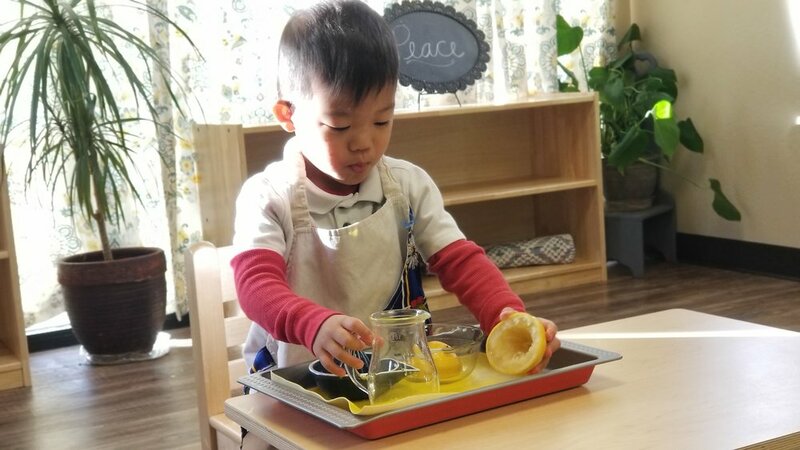 In the first few exposures to a food prep lesson, the child will do the activity with the teacher as they will learn the proper steps to getting the food ready. As the teacher sits near the child working, she encourages independence allowing the child to continue to do the activity on their own. 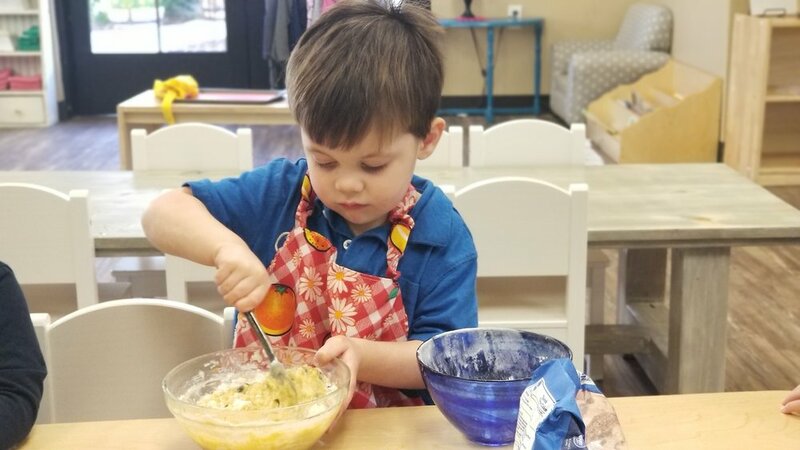 With activities such as cutting, peeling, picking, and pouring, the toddler continues to develop their fine motor skills as they do the preparations. Grace and Courtesy is tied in as they learn that the food is prepared for all their classmates. The toddler has the opportunity to serve the food to their classmates during snack or lunch time. During snack time in the class the child serves their food on their plate, pours water into their drinking cup, then places it on a tray, followed by walking over to their snack table to finally eat it. As they serve the food, they learn to use tongs by opening and closing it, practicing their motor skills. They also learn how to properly measure the appropriate amount of water to pour into their cups. Then as they walk over to the table they learn how to balance these items on a tray as they are on the go. There are only two chairs on the snack table which gives the toddler the opportunity to learn to be patient and to take turns. Lunchtime is also a great time for the toddlers to learn Grace and Courtesy. Each day the children set the table for their friends and classmates. They follow the order of setting out places mats, plates, utensils, napkins, and each lunch box in their chair. After they have set their food out on their plates they learn it is polite to wait to eat until all their classmates are seated. As they eat lunch they practice the use of utensils and napkins. They also learn table manners like chewing with their mouths closed, speaking after swallowing their food and asking to be excused when going to the bathroom or cleaning up after their meal. Learning to mix ingredients to make banana bread for the class. Slicing apples to share with classmates. Pressing lemons and removing seeds to make lemon water for all to share!